More T-shirts! These are the first of the “new to me” patterns. I’ll start with the Grainline Lark Tee. I bought this pattern a year or so ago, but have only made one tee from it, and that was for a friend! I had the PDF pattern, and sent the copyshop off to the other half to print for me at the office on their nice big plotter. It was about time to use the pattern for myself, I went with the short sleeve, v-neck version. I traced the 12, based on my high bust measurement, and made a FBA as described on Maria Denmark’s website. There’s only one thing that’s constantly bugging me, there is a fold of fabric that ends up looking like I need to dart it out at the armhole. I have already done that in paper, but the little bugger is still there! Any tips, tee shirt gurus?? The fabric for this one came from the NEC, I forget exactly which stall. I love the graduated sizes of the white and black stripes, it’s a viscose/modal jersey, soft and drapey and lovely to wear. I’m really happy with how it all turned out, I have to admit I was a little worried going with such a “small” size! But it worked! The sleeves are the perfect length, and I like the fit on the body, especially the looseness around the waist and hips. The instructions are pretty good, the neckband went in very well too. I just need to remember the seam allowance on this pattern is very, very small, only 6mm! I forgot that on the first seam, and sewed the shoulders at 1cm instead… It doesn’t seem to have done any damage, even the sleeve head went in ok. The second tee for today is one I know I will be making loads more of! I downloaded the Basic Instinct Tee from Sasha at SecondoPiano – finally!! I’d seen lots of versions of the tee on Instagram (just search the hastag #basicinstincttee) and really liked the relaxed fit that everyone was achieving. While a fitted tee is great, I like a loose one more for the summer. I had one more blue and white striped jersey from Montreux Fabric to use, this one has a cool double thin white stripe on a navy blue ground. The fibre content is polyester/viscose, I try not to buy polyester, but the stripe was too good to pass up! Sasha has written brilliant instructions, and has spent a lot of time making sure her tee can be made with lots of different stripe patterns, and that those stripes will line up everywhere. If you take the time to do it.. I have to hang my head and say I ignored those bits of the pattern and instructions and just ploughed on (I really really wanted to wear this tee – fast). I promise that the next one I do I will definitely follow the stripe matching instructions. The pattern is simple, round neck, short sleeves and relaxed, loose fit throughout. It’s incredibly comfortable! I don’t usually go for high necklines like this, I don’t like the feel of fabric so close to my neck, but this is just fine, even for a fusspot like me! I made the XL, no FBA, no adjustments – next time I think I’ll size down, see how it goes. It all went together incredibly well, great instructions and very well drafted pattern. I highly recommend this pattern, subscribe and you’re in business! This is the perfect pattern for allotment tees, the loose fit means more comfort in the heat & the round neck keeps the sun off me. I have to make lots and lots more! Thanks Sasha, for a brilliant little tee pattern! There they go again, I just cannot keep my hands out of my pockets! I have one more tee to show off, and I still cannot decide on my favourite! I think I might need to get a few plain coloured tops now though, there are enough stripes! What’s your favourite t-shirt pattern to make? I’ve been making lots of grey items this year, it’s a colour I really like, especially for the winter. It’s going to be overtaken by blue for the spring and summer soon! Back in January, or maybe even February, I finally made the Lark Tee. It had been on the list to make last Spring, then bumped to Autumn, and now it’s finally done. The fabric is a pale silvery grey viscose jersey from Croft Mill Fabric, also bought early last year. It is lovely and soft, with good drape. I used the copy shop version of the Grainline Studio pattern, this being the first pattern from Grainline that I’ve made. I chose the scoop neckline with three quarter sleeves. I made a 3cm FBA, which I now think I could have done without in the size I made – either that or add the FBA to the smaller size. The instructions are clear and concise, there’s not much to making a tee really! The shoulder seams were stabilised with iron on tape, and I feel that this fabric could have done with something on the neckline too, but not the iron on stuff, it makes it too stiff. But without any stabilisation the neckline tends to drift downwards during the day. Fabric with good drape will droop! This is also the first time I’ve attempted blog photos myself. Without any daughters at home and a hubby who just doesn’t “get” what I’m trying for, I’ve tried doing the photos on the self timer on my phone. Nothing like taking millions of pics of yourself to make you feel self-conscious and a bit silly! Another top that had been on the sewing list for a while is from last February’s Burda magazine (103 2/16), it has a hi-low hem, woven in the back and jersey in front and on the sleeves. I had thought it would be good in a linen jersey that I got from Ditto Fabrics, either last year or the one before, with some silk left over from a previous project on the back. But before I committed my nice linen jersey, I definitely wanted a toile!! I cut the 44, adding a small FBA, and due to fabric shortages had to cut a yoke for the back, with the pleat falling from that, rather than from just below the neckline. I’m fairly chuffed with it, probably will shorten the back hem a bit, you end up sitting on it so it gets all creased and crumpled – not a good look in pretty silk. I’d also need to enlarge the sleeve in the bicep area for the linen jersey. In this pale grey from Fancy Silks in Birmingham, the sleeve is ok, there is enough stretch, but the linen hasn’t got as much give. I need to drop the darts a couple of centimetres and might also make the FBA a little bigger – just in case! It must be right for the linen and silk! I’ve worn this top loads since it was finished back in early-mid March, so that must mean it’s a successful toile – and very wearable! 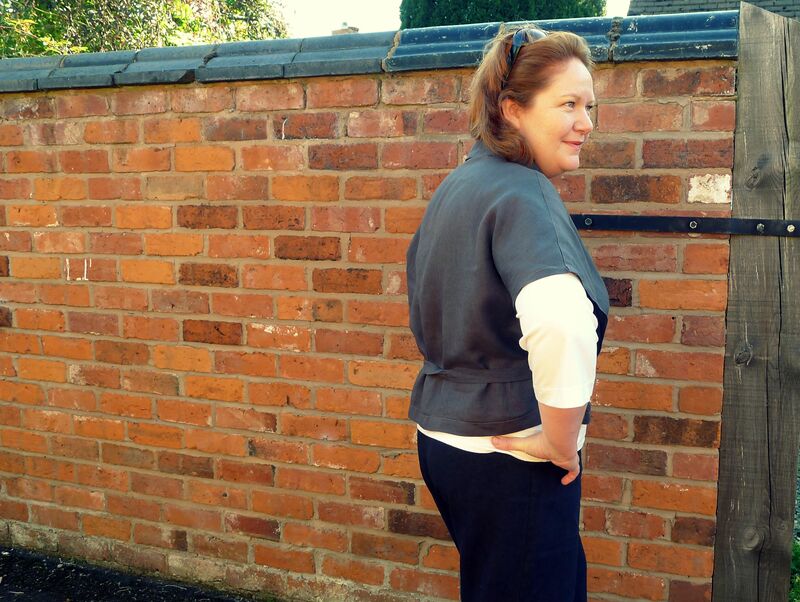 I’ve managed a few more self-timer photos of some other tops made this month, hopefully they’ll be online soon. I want to make a pair of Morgan Jeans for the summer, started a toile this week which wasn’t altogether great, so I’m working out the gremlins there. I already have the fabric – bought it last year with the pattern when it first came out…..
Three strikes and I want more! 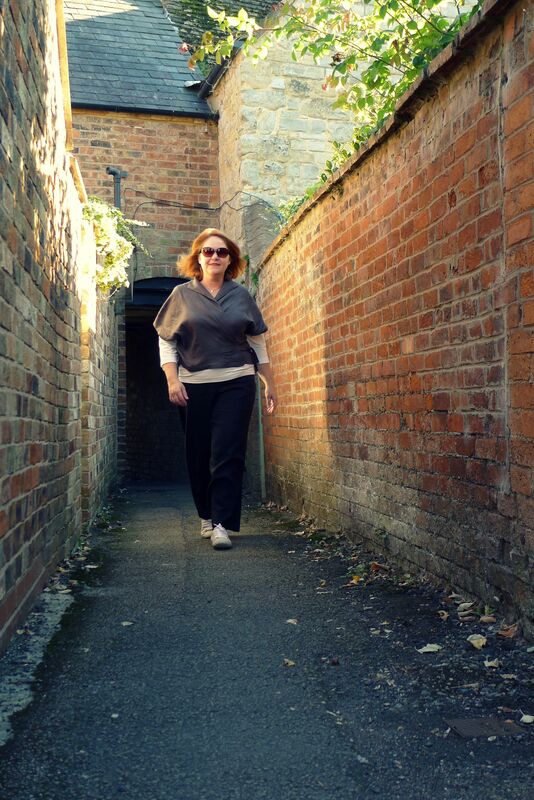 This is my third Longley Cardi by Wendy Ward, previous versions here. I had in mind to make a stripe version of this cardi for a while, I pictured wide stripes in either a sturdy or drapey jersey. This particular stripe jersey is from Ditto Fabrics, the last of the pieces I binge-bought back in January! I saw the picture, registered the size of the stripe and added 2.5m pretty much immediately to the basket. I didn’t read any further. You know what’s coming…. So when you don’t order samples and don’t read the fabric description properly, sometimes the fabric that arrives is a little bit of a surprise! The stripes run the length of the fabric, opposite to what I thought they’d be. I was expecting your typical viscose jersey, in feel and handle. What came felt rather different. It’s described as having a “silky feel”. To be honest, when it came I would have described it as full on polyester. So procrastinated, wasn’t even sure I liked it. One thing I really don’t like is waste, and not using this fabric felt a whole heap like wasting. So I just got on with it. I wanted the stripes to line up going up and down across the bands, so I made sure to cut the hem and neck bands very carefully to line up with the back piece on the fold. I couldn’t get the front band stripes to match both the back and front, and as the front has lots of drape it was decided it would be more forgiving to non-matching. After all the kerfuffle and uncertainty, I’ve decided I do rather like this cardi, stripes, fabric, the lot. It counts towards my Sew Seasonal Wardrobe and being a staple blue and white, will go with pretty much everything already made and those pieces yet to be sewn. 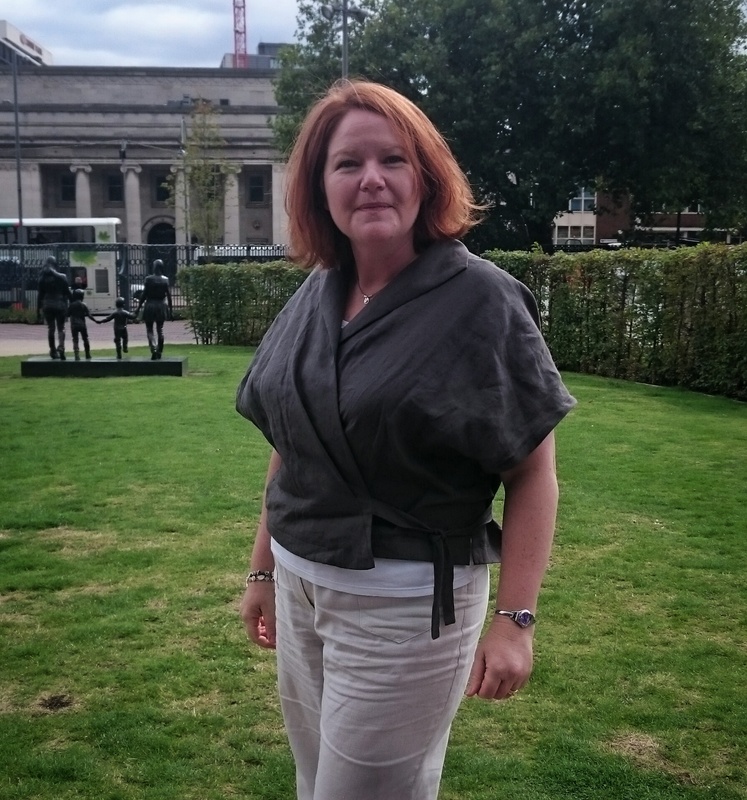 Birgitte Tee, Birkin Flares & Longley Cardi. Silver trainers from La Redoute. I like the way the stripes change with the drape on the front, horizontal stripes on the front neck band contrasting with vertical stripes on the sleeves. It’s a more interesting cardigan than I thought it was going to be! No bad thing there. So it’s a success in the end, have you had doubts about a project, only to have it turn out ok on the day? No Sewing, Plenty of Shopping! Well, not no sewing at all, but I haven’t got much to report right now as I have no photos! I have a blue viscose tee and blue and white herringbone Burda trousers and a new pair of gorgeous Birkin Flares. But nowhere to be seen. What I can show you though, is fabric shopping…. My favourite annual fabric shopping opportunity happened this week, Sewing for Pleasure at the NEC. I always go on the Thursday, the first day. You get the best picks first thing on day one! I went prepared, a wad of cash in my wallet that was all I was allowed to spend and two large carrier bags in which to stuff my purchases. I was meeting with an ex-student whom I hadn’t seen in about 2 years, so it was going to be a good day! We had a fabulous time catching up and buying pretty things. I started at Rosenberg & Son – the only place to start. As usual there was a crowd 3 people deep all trying to get access to the front to feel and grab precious bolts of fabrics. Some people have sharp elbows… Anyway, once I finally reached my destination I bought 2.5m of floral printed twill for a friend (who’s making a dress), 1.2m of blue and white geometric print John Kaldor viscose jersey and and 2.5m of the prettiest green and blue parasol print poplin. My plans for the jersey is to turn it into a tee of some sort – no idea which pattern just yet. The parasol print will be the trousers from the pantsuit in the plus size section of the April issue of Burdastyle magazine. It’s going to look good on the beach next month!! From there I found Doughty’s. All 2-3 stalls. Why so many? Anyways, one of their stalls had a majority of quilting cottons, the others had a mixture of good fabrics, including a decent selection of ex-designer fabrics like Paul Smith. I bought a metre of pretty navy and white seaside print cotton to make baby things for a friend’s soon to be born little girl. February’s issue of Burdastyle has some really cute patterns for baby clothes. They always have lots of lovely fabrics, this time I managed to buy from two of the stalls. On 2 different trips I bought 2 metres of washed linen in grey and white (looks like a cotton & linen blend) and 1.2m of black and white stripe viscose jersey. I have a pretty good idea the linen will become a pair of floppy trousers, although a friend suggested an unlined jacket, and the jersey is destined to be a tee. Again, pattern undecided. I found a new fabric store at the show this time, Montreux Fabrics. They haven’t got their website up and running just yet but they did have plenty of gorgeous fabrics! I particularly enjoyed rummaging through the “remnant” baskets. Their selection of jersey fabrics was really good. I ended up only buying 2 pieces, 1.8m of plain blue viscose jersey, again it’ll be a tee of some sort, and 1.4m of white viscose jersey that’s destined for Del. Just when I thought I’d done all my buying, daughter No2 turned up! My friend wanted to go back to Rosenberg’s so we tagged along. Bad decision! Or maybe not. Two more pieces of fabric were added to my bags! Daughter no 2 liked a piece of Liberty lawn for a vintage blouse and then fell for a large floral print stretch cotton for another blouse. I will wait for her to come home for the Easter hols to pick the exact patterns she wants. I killed a little time at the Bernina stand, I still wouldn’t swap either of my old machines for one of them. The overlockers look even more involved than mine! I looked at the coverstitch though, it has three needles and costs a mere £599. To sew hems…. Twin needles are much cheaper! I browsed the patterns stands, picked up one Burda trouser patterns but on the whole I left the commercial patterns alone. So all in all it was a pretty fabulous day. My wallet was empty, feet only a little sore and fabric bags full! It was all so worth it and I have plenty to sew in the next 4 weeks! Author Anne WPosted on 19/03/2016 Categories fabric shopsTags doughty's online, jersey, linen, montreux fabrics, rosenberg and son, sewing for pleasure10 Comments on No Sewing, Plenty of Shopping! I got tempted by the new Sewaholic Vancouver range of patterns on their release earlier this year and bought two patterns in the 2 for 1 launch special. I liked the Fraser sweatshirt to make for myself and the girls, and I got the Cypress running cape, definitely only for making for the girls! On a recent trip to Birmingham and The Fancy Silk Store, I bought a fabulous fleece lined jersey in charcoal. As Daughter No2 was with me at the time I got enough for both of us to have a Fraser sweatshirt. She didn’t want any of the fancy stitchlines, just a plain one please, with looong sleeves. She has rather long arms and battles to find bought tops that stay anywhere near her wrist. Everything ends up looking like it should be 3/4. The fabric doesn’t have much stretch, it’s pretty sturdy, so I hope it fits…. 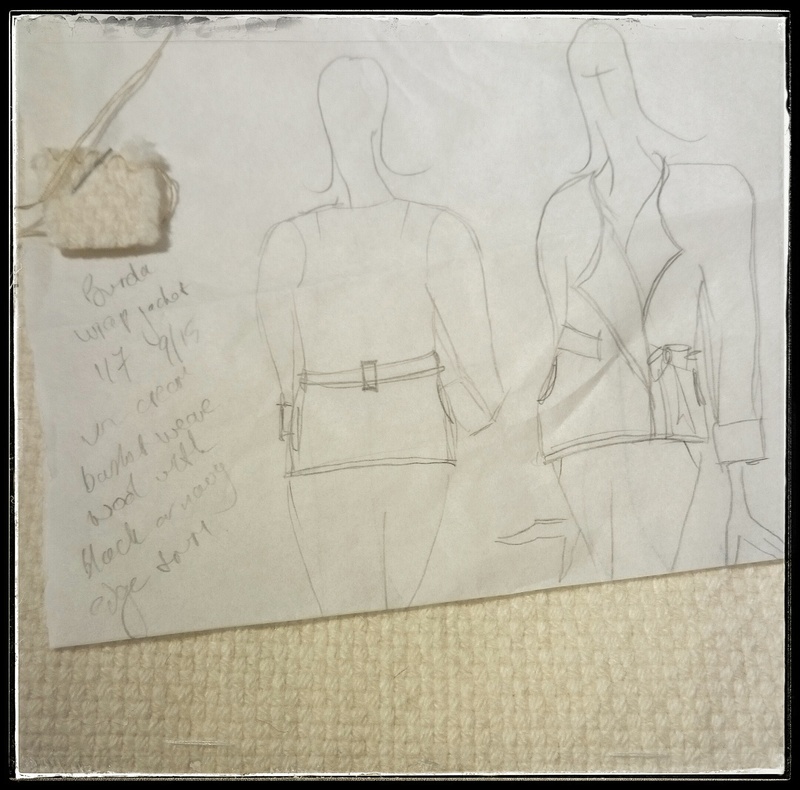 I made an adjustment to the shoulder width (1.5 cm wider) and lengthened the sleeve by 4cm. She won’t mind if it’s a little long but will be very disappointed if it’s short. I used View B for the front and back and added length according to the sleeve for View A, but used B… Make sense? I started with the size 4 on the top part and graded to a 2 at the waist and hip. Funnily enough, in Burda (and almost everything else) patterns she’s one or two sizes bigger in the hip than the waist, but with Sewholic we need to go down by 1 size. The pattern itself is pretty easy, especially if you’re doing View B! Basically, think Renfrew in a sturdier fabric. The construction is the same. The only thing I would change about the order of work would be attaching the cuffs to the sleeves. Because I sent down to size 2 on the sleeve (skinny arms) it was nigh on impossible to get the cuff on after the side seams had been sewn. Next time I’ll attach the sleeve cuffs and then sew the sleeve and side seams, turning up the cuff and just attaching with the sewing machine. Although I still won’t be able to get the ends over the free arm. But overlocking it was damn tricky! I hope that when she comes home after her hockey tour in the Easter hols that she’s happy with it. She’s seen some photos but it still needs to be tried on. So, riding high on a quick easy make, I decided I’d make another. But not my version. I’d had a little splurge this weekend buying fabric online (I know, I’m supposed to be clearing the table of stashed fabrics) from Ditto Fabrics, Fabworks and Croft Mill Fabrics. Bad. I’m hopeless. Anyway, I wanted to be sure the fabrics all got used up as soon as they arrived, so on Tuesday the Fabworks delivery arrived (as well as the Ditto stuff, but that’s for later). I’d ordered linen, of course, and two pieces of jersey. The one I wanted for the sweatshirt is blue with circles and flowers, sort of reminds me of delft tiles, and I wanted to use it to make something for my Mum. I decided to go with View A, although I wasn’t going to use a contrast fabric. This time I didn’t need any pattern alterations, my Mum’s measurements put her firmly in the size 12. Two new sweatshirts, one new favourite pattern. Again, construction was simple and straightforward, the only part you need to watch is the triangle point insertion. It was done in an afternoon and I’m pretty happy with it, although on close inspection I know I missed centering the top front exactly, but I don’t think anyone looking casualy will notice, and no, I’m not unpicking it!! So to round up the pattern stuff – Sewaholic have delivered a quick make with clear, concise instructions alongside plain talking illustrations. I can see a whole stack of these being made, and as you have such a plain canvas, whose to say there won’t be many hacks on the horizon for those so inclined? Already the Renfrew had been hacked into so many different things by enterprising sewists. Fraser View A, pointy details. Now, Fabworks. I’d spotted them on Instagram, someone I follow had bought something yummy, so I took a look. They have a good selection of fabrics, and lovely, interesting jersey fabrics. The prices are pretty good too. The ordering only lets you pick whole metres, which means for a tee shirt you’re either going to be short, or have too much. So I emailed them asking if I could have a custom order and they were very helpful. So if you like what you see there but don’t want 1 or 2 metres (or more, who’s counting) email them for a custom order. Postage is a flat £5, but it comes the next day!! So for impulsive shoppers, that’s not bad. So far I’m happy with the pieces I’ve ordered, I will see how the fabric behaves in the long term before I can judge the quality of their offerings, but on customer service they’re sitting pretty on my list of online shops. If you’re sewing this weekend, have fun! With my sewing plans all laid out for easy viewing, I decided pretty quickly on what I wanted to start with. 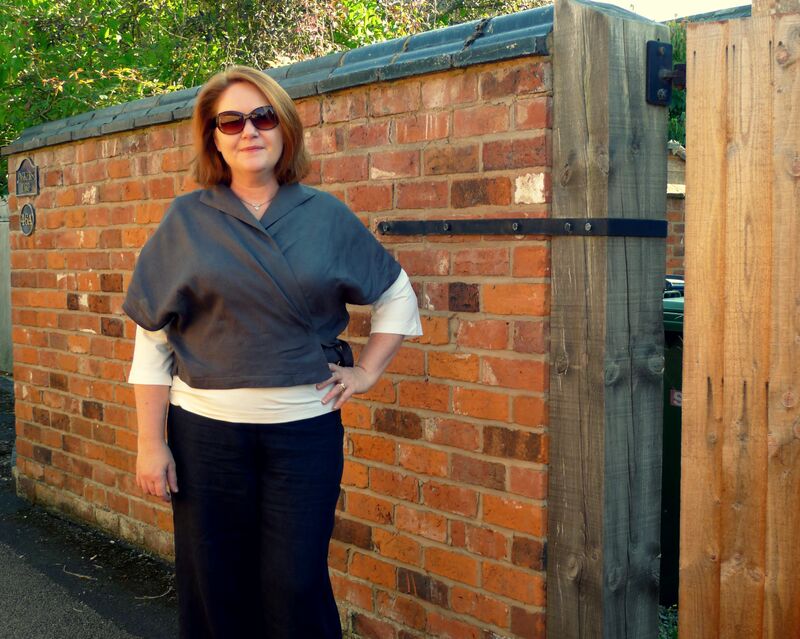 It will come as a surprise to you that it is neither a Burda pattern, nor a self-drafted one! In fact, what I wanted to start with wasn’t even a piece of fabric that had made it onto the pile this year, nevermind the season. So much for not getting distracted!! I’d given in to purchasing the Merchant & Mills workbook after seeing a couple of items online that I liked (and a couple I wasn’t entirely sure of). 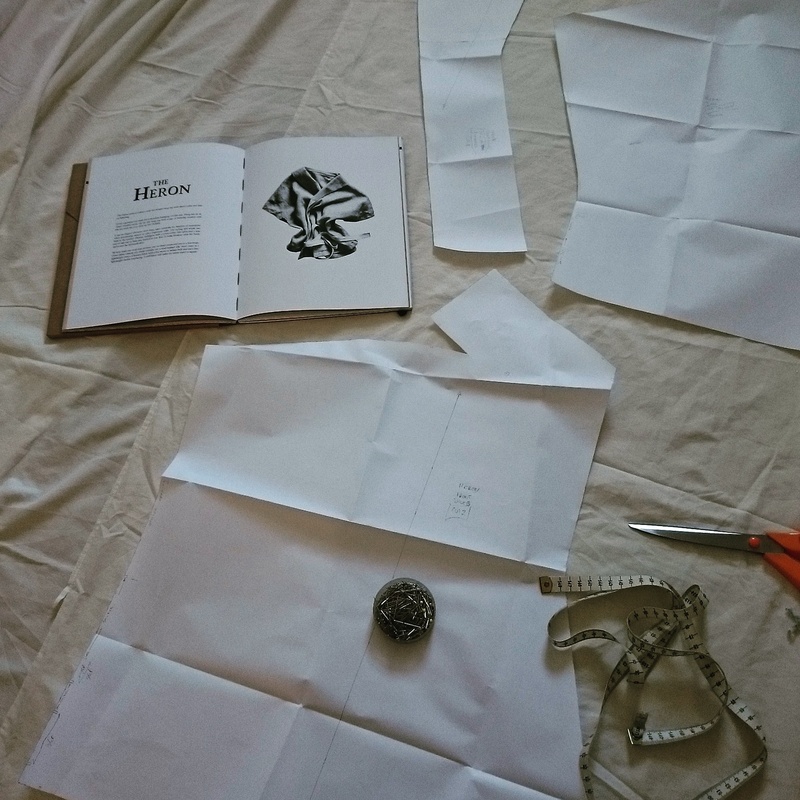 I checked images and some blog posts, looking at some of the reviews of the book itself, not just individual patterns. The one thing I couldn’t see was the sizes the book catered for. They state the patterns go to size 18 and I managed to find some published photos of some sort of measurements, but they were never clear enough to see exactly what they were. I thought I’d take a gamble & get it anyway, figuring if it wasn’t going to work for me I could always sell it. 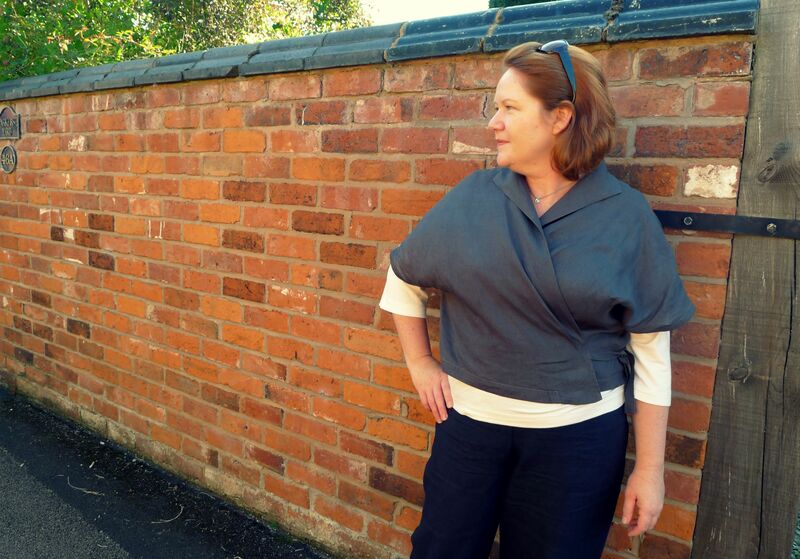 I rather liked the wrap top, called Heron. Wrap tops don’t always work terribly well on fuller busted figures. I’d seen this post while conducting my research and figured if it worked on this lady, it wouldn’t look too terrible on me! I also decided on a linen to make it in. Deep in the fabric cupboard, in the linens box, languished a beautiful, light weight, warm grey linen. This is one of those pieces that has a slight sheen to it, no slubs and the most perfect smooth texture. It’s been hanging around for about 8 years, too gorgeous to make just any old thing from, but perfect for the Heron top. The book arrived and was immediately devoured. There are patterns I will make, others that I shudder at. The overall asthetic is a bit arty teacher who doesn’t own an iron, but each to his/her own! I did spot a problem though. On each pattern page there is a helpful table of finished measurements, diagrams of pattern pieces, fabric requirements etc. Nowhere could I find a size table. Nowhere. Please tell me what the point is of providing finished measurements when you have no starting point?? I checked the Merchant and Mills website, perhaps it was there on the patterns you buy individually.. Nope, only finished measurements. In frustration I googled “size table for merchant & mills patterns” which lead me to a PDF I could download and lo and behold, sizes!! Am I going on too much about this? Perhaps, but it annoyed me that it wasn’t in the book. Apart from that, this isn’t going to be a review of the whole book, I have only made one pattern so far!! From the size table and finished measurements of the Heron I chose the 18 & made a toile in a lightweight calico. I wasn’t worried too much about the fit in this exercise, but the look. 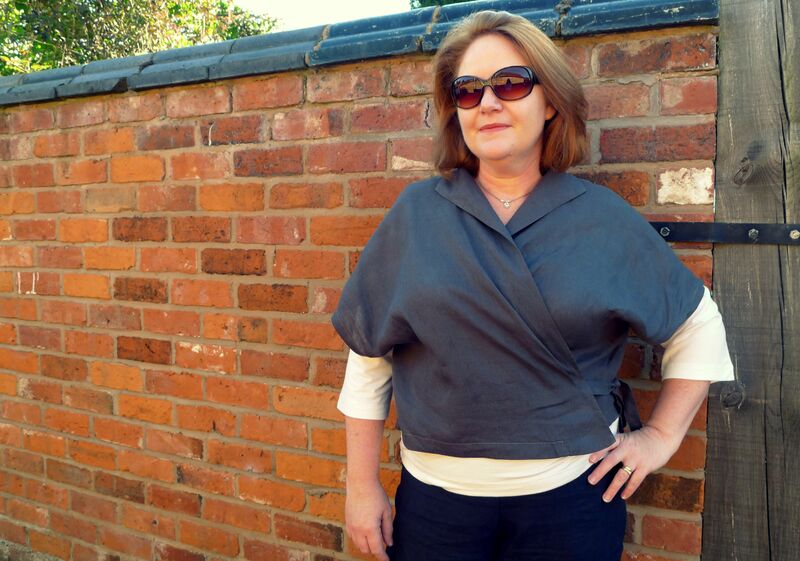 Sometimes wrap tops feel too enveloping and claustrophobic. It seemed ok but I needed to make the ties longer, much longer! The patterns are easy to trace, nothing like the Burda mazes. Markings are shown with little rectangles and seam allowances are shown as notches. Most are the standard 1.5cm but on this pattern the side seams are 2cm to allow the armhole openings to appear neater when topstitched. It’s a really easy pattern to make, not taking long at all. I used Gill Arnold’s fine sheer polyester interfacing on the front facing and shawl collar piece, this gave the fabric just enough body. The ties were short for me, I lengthened the short, left piece by 10cm and added that length to the right piece. 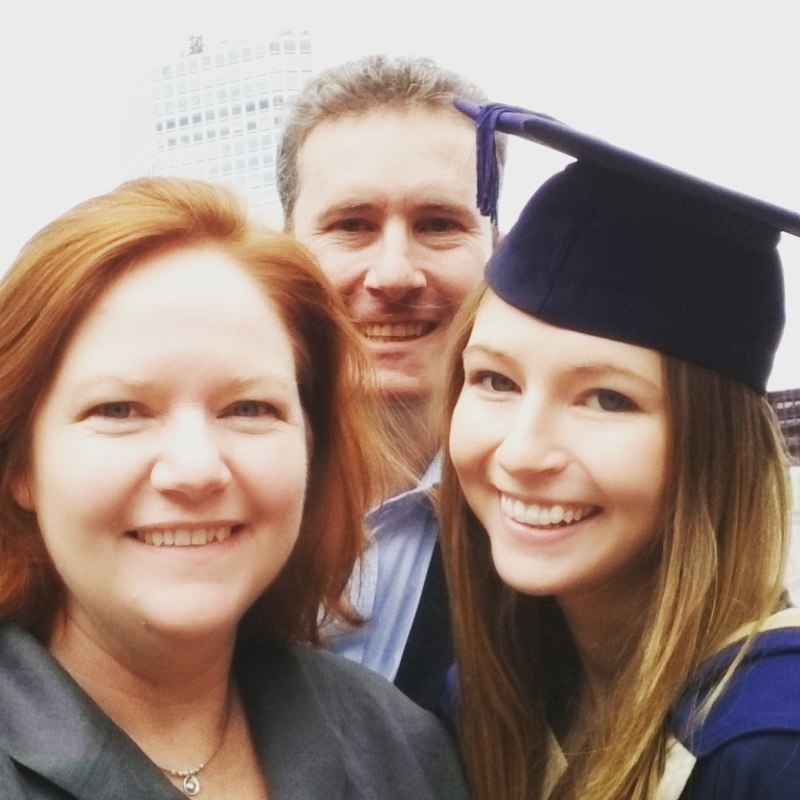 Mr W, Daughter No1 & myself after the graduation ceremony. I had thought it would look pretty good with a longer sleeved tee underneath, I think black, grey or white would work pretty well, so the next item to be made from the table of goodies was an off white viscose jersey. I chose the Maria Denmark Brigitte tee, bought with a birthday discount. 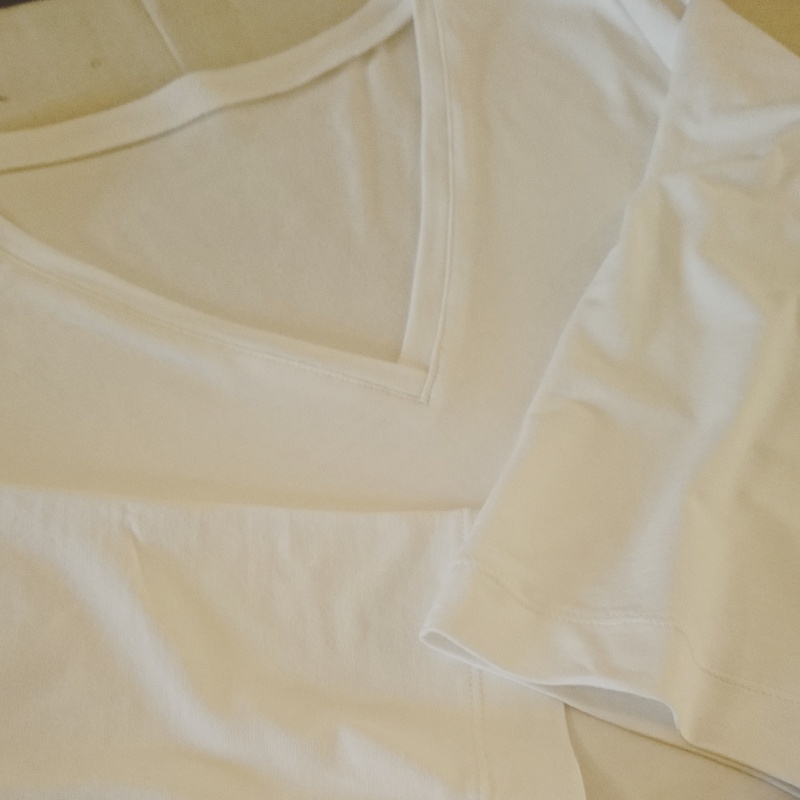 A standard tee, nothing fancy, I chose the 3/4 slightly trumpet shaped sleeves and v-neckline. It needed an FBA to fit across the bust but otherwise was just fine. This is the first time I’ve made a Maria Denmark pattern for myself, & I’m hoping to use the sleeves from this pattern for the Day to Night Drape top. 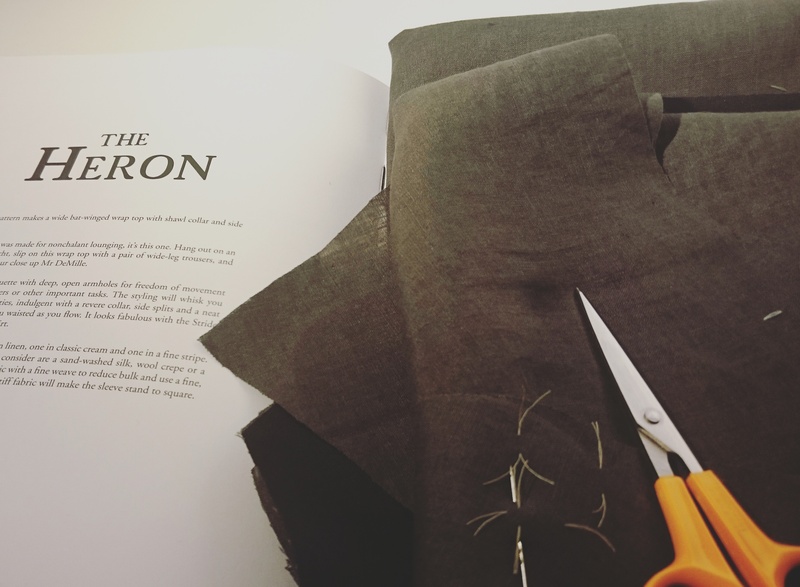 Putting the Heron & Brigitte together works fabulously well, and even better with my wide legged black linen Burda trousers! Ok, I know it could be longer, especially in the front, and Kimono sleeves always look funny on the fuller busted, so I don’t think I’d get it too much better than this. But I’ve worn this top a few times now and can’t really complain about anything. It also irons really well, & with linen that’s a massive bonus! More wrapping, we’ll see whether it works on my frame or not!